Backup quarterback N'Kosi Perry passed for a career-high 224 yards and three touchdowns and Miami's defense took care of the rest as the No. 21 Hurricanes whipped visiting Florida International 31-17 on Saturday in Miami Gardens. The redshirt freshman replaced starter Malik Rosier in the first quarter and was 17-of-25 passing. He was intercepted once. Miami finished the game with 488 yards of total offense while holding the Panthers (2-2) to just 187 yards and seven first downs. The Hurricanes (3-1) lost their bid for a second shutout this season when FIU quarterback James Morgan found receiver C.J. Worton open down the sideline for a 35-yard touchdown pass midway through the fourth quarter. The Panthers cashed in on a fumble recovery at Miami's 11-yard line with a 29-yard field goal by Jose Borregales, and Morgan then found Worton for an 5-yard touchdown pass in the final two minutes after the Panthers recovered an onside kickoff. The Hurricanes lost their No. 1 receiver, Jeff Thomas, early to a dehydration issue, but sophomore Mike Harley responded with a career-high seven receptions for 76 yards. Tight end Brevin Jordan finished with five catches for 67 and a touchdown, and Lawrence Cager had two touchdowns on two catches. 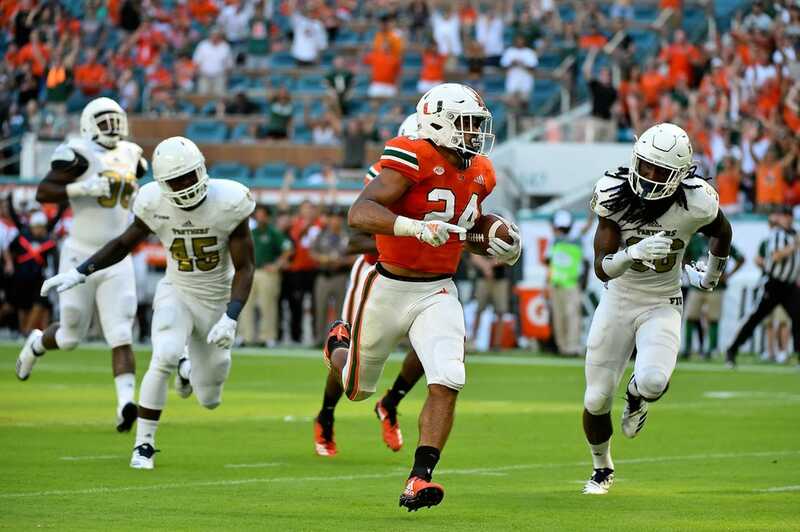 Perry entered the game at the 7:35 mark of the first quarter with the Hurricanes at their own 13-yard line and engineered a nine-play, 87-yard drive that culminated with running back Travis Homer's 35-yard run for Miami's first touchdown. Perry went on to complete his first 10 pass attempts, including a 26-yard touchdown strike to Cager on the first play of the second quarter. Perry finished the first half 11-of-12 passing for 158 yards and two touchdowns. The Hurricanes established their defensive dominance early. The Panthers managed only 15 yards in total offense the first half, 14 of it on their only two completions, and their only first down came via a personal foul penalty against Miami in the first quarter.